Chart Wealth... Gold Sector Remains In Mint Condition! January 2008, Volume 5 Issue 1 Know It - Profit! 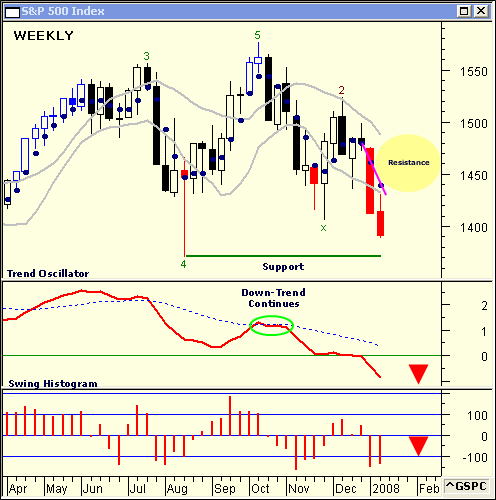 In this issue, is the Standard & Poor's 500 near key support? Also, Kinross Gold Corp. makes coin for the AMEX Gold Bugs Index. The broad market indices are on a slide. The Standard & Poor's 500 (^GSPC) is giving back last years gains... down 5.6% in the first week of the new year! The current down-trend in this weekly chart of the S&P 500 was confirmed in October when the Trend Oscillator met resistance at its long-term average. The Swing Histogram remains below the -100 line... revealing the strength of the down-trend. Also, the Speed Dots remain on line. The first dot to push above the line will forecast a price move into an area of resistance between 1,435 and 1,485. Finally, the S&P 500 is nearing psychological support at the 1,370 mark... possibly creating a wide-ranging channel. 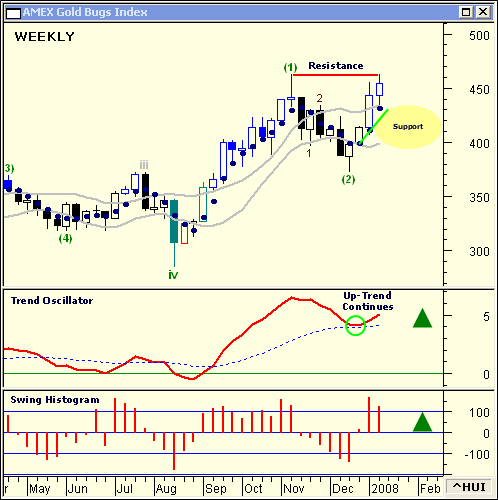 The AMEX Gold Bugs Index (^HUI) is nearing resistance at its all-time high. Will this shining index forge ahead? After a brief pull-back in December, the Trend Oscillator continues to reflect the strong up-trend in gold on this weekly chart. The Swing Histogram remains in the +100 area... measuring the strength of the up-trend. The Speed Dots continue to accelerate. Dots above the line forecast further gains. 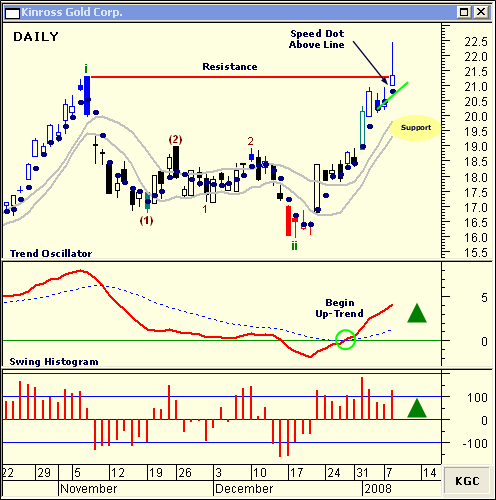 Look for Gold Stocks to pull back to support before punching to new highs. Kinross Gold Corp. (KGC) is a component stock of the AMEX Gold Bugs Index. KGC engages in mining and processing gold and silver ores, and the exploration and acquisition of gold bearing properties in the Americas, Russia and internationally. On the daily chart, KGC met resistance at the previous high of $21.30. At the end of December, the Trend Oscillator marked the beginning of the current up-trend. Additionally, the Swing Histogram reflects the strong up-trend... remaining above the +100 area. The Speed Dots continue higher, with the latest dot located above the line... a sign of strength. Expect KGC to trade down to support between $20 and $19 before advancing further. Now is the time to define your trading goals for the year. Then, adjust your stock portfolio, as necessary, using sound chart analysis.